Have you found an online vendor selling Dos Maderas Luxus? Dos Maderas PX Luxus rum is produced using rums from Barbados and Guyana. The unique aging process includes an initial 10 years aging in the Carribean in oak casks. This is followed by an additional 5 years of aging in Spain in casks used to age the sherry Don Guido. Bodegas Williams & Humbert produces the Dos Maderas family of rums, a well known Spanish winery founded in the late 1800s by Sir Alexander Williams. The region of Spain where the winery is located has a climate perfectly suited for wine and is known as Europe's wine cellar. Wow wow wow wow ! OH my god ! In the mouth, oh my god ! The alcohol disappears ! So much flavour ! Very sweet, but in a good way. So round, perfectly balanced, ADDICTIVE !!! A bit of alcohol at the beginning but if you let it rest for a while in the glass the sticky alcohol fades and you smell sweet aromas of almond, caramel, orange, and vanilla. In mouth you feel the smoothness of this rum. You taste almonds, vanilla, oak and some sherry. A very sweet rum. The aftertaste is a bit to short with sweetness, sherry and some spice. 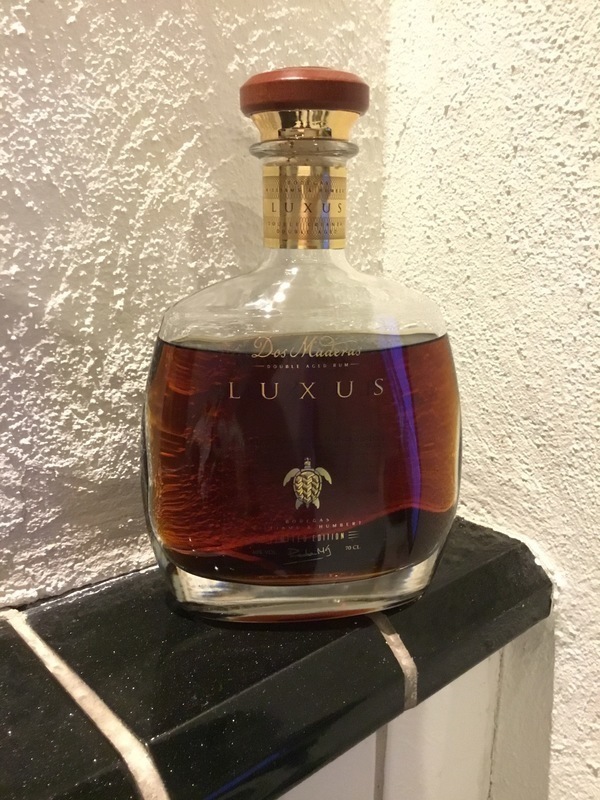 The Dos Maderas Luxus is obviously a sipping rum that I enjoy neat. One of my favourites. This is a very good rum, which is surprisingly sweet. I generally like sweet rums, and this is no exception, but the sweetness comes across a bit artificial tasting to me. Tastes of molasses, spice, sherry, oak, vanilla, almonds, with a unique sweet additive that I can't quite place. It's definitely an excellent rum, though it falls just a bit short of the rums I've rated a 10. Still, this is a high 9 to me, and definitely worth trying if you get the chance. Lækker rom, oser af kvalitet hele vejen igennem. Den tager lige skridtet videre fra den meget lækre 5+5. Lidt dyr, dog en fed rom at have i samlingen. This one is a very unique rum. A very unexpected yet somehow familiar flavour. It tastes like a tropical island. Coconut, vanilla bean, molasses, ripe fruits. It is an absolute explosion of sweetness and flavour that is rich,silky smooth and very easy to drink. It's not my everyday as it's very rich but still something I enjoy for something completely different at times. A very good rum that everyone should try at least once. Wow, so beautiful, excellent choice, fabulous finish, great flavour, sublime. Sugar added. And opens up nicely with a (very) few drops of water. Does have notes of a nicely aged port (my other favourite spirit). Thus far, my 2nd favourite after the Appleton Estate Exclusive. Skuffende - især med prisen in mente. Jeg havde forventet mig noget mere. Got this one for christmas and after about 30-40 rums I tasted in my careera, this one might be the best "sweet" I ever had and one of best overall. Dos Maderas Luxus má obdobný výrobní postup, jako verze 5+5, s tím rozdílem, že v Karibiku zraje deset let, a pak 5 let ve Španělsku v sudech po sherry PX Williams & Humbert. Ochutnán v přímém srovnávacím testu Dos Maderas 5+5, Selección a Luxus. Shrnutí: Ochutnáno v rámci přímého srovnávacího testu s kamarádem, kdy jsme srovnávali tři rumy Dos Maderas, a to 5+5, Selección a Luxus. Jednoznačně je verze Luxus nejlepší z ochutnaných Dos Maderas rumů. Konečné pořadí kamarádovo i mé bylo naprosto stejné, 1. Luxus, 2. 5+5 a 3. Selección. Rozdíly ale nebyly nijak velké. Selección je sice až třetí, ale zaostával jen ve vůni, v chuti mi přišel dokonce o trochu lepší, než 5+5, asi díky vyššímu procentu alkoholu. 5+5 je ale vyrovnanější, co se týče vůně s chutí, je lépe vyvážený. U Luxusu jde kvalita nahoru díky největší vyzrálosti. Otázkou je, zda ten poměrně mírný nárůst kvality stojí za tu výrazně vyšší cenu, to už si každý musí rozhodnout sám. Pro zajímavost aktuální ceny u jednoho mého oblíbeného e-shopu: 5+5: 890,-, Selección: 955, Luxus: 3350,-, ale ten se dá sehnat i za 2848,- v jiných shopech. Pro mě zůstává největším favoritem i s ohledem na cenu verze 5+5, ale klidně ji pro změnu budu střídat i se Selección. Luxus jsem rád ochutnal a udělal si názor, ale pro mě osobně nárůst ceny neodpovídá nárůstu kvality. Kdybych ale chtěl nějaký luxusnější dárek k výročí atp., určitě stojí za uvážení. I find this rum difficult to find in the US, but was lucky enough to snag a bottle when I went to Spain. I patiently waited until I was home to taste it, and wow was I happy with it! The bottle is simple yet beautiful, and the color is just perfect. It's appetizing from the moment you look at it, and the taste that follows is near perfection! The nose wasn't as rich as I hoped, and to me didn't match the color or taste of the rum. I expected a to pick up on a strong caramel scent, but that wasn't the case. The taste however was just amazing, and easily places this rum on my favorites list. Viscid sweet liqueur. Taste is full with various flavours like vanila, fruits with hints of burnt wood. It is a bit sticky, it left a film in the mouth. Aftertaste is bittersweet. The overall sweetness and high viscosity brings this rum down. I'm a big fan of the 5+5 so purchased a sample of the Luxus from Master of Malt it was a little pricy around the £10 mark the bottle retails at £120 so worthwhile buying a sample first. This is a wonderful sipping rum, it's smooth and a delight to drink. You can definitely smell and taste the difference the extra 5 years (10 in total) aging in bourbon in the carribean. The further 5 years in Don Guido 20 year old finish is now much more rounded and complex, less sweet but still retaining Dos Maderas' unique character. There are additional notes of coffee and cacao carries through on top of the raisin and dried fruit its reminiscent of childhood chocolate raisins. Would definitely drink this again will have to get myself a bottle when I get the chance! nejdříve přijde lahodná chuť, jemná a úžasná vůně projde nosem a po polknutí zůstává pachuť, jako kdyby byl tímto rumem vyplachnut nádražní popelník. i za 300 bych ho nekoupil. natož za desetinásobek. In comparison to other rum brands, this one is unfiltered. It has a sweetish brilliant aroma containing a lot of tones. It has a rich excellent taste and a perfect afterburn... it is not that sweet as other Dos Maderas rums and in my opinion it is worth the price. This is the smoothest drink I have ever had, it has almost no bite whatsoever. It is sherry heavy and goes well with cigar, but the sherry aroma seems a bit too artificial to me.